When the conversations surrounding the Michael Brown and and Eric Garner cases were at their strongest late last year, Shelterforce conducted a survey, asking our readers how they felt about the relationship between law enforcement and the communities in which they work and live. The answers we received ran the spectrum, from “Police presence is always a good thing,” to police interaction is “one of our biggest areas of calls, complaints from people seeking help.” But what was most interesting were the responses in the middle from the large number of people working in community development who said they need and appreciate the protection police provide to residents, but have seen firsthand the sometimes unequal and unfair treatment their constituents receive in their dealings with police. The majority of respondents said they felt “conflicted” about the police’s presence in their neighborhood/service area. 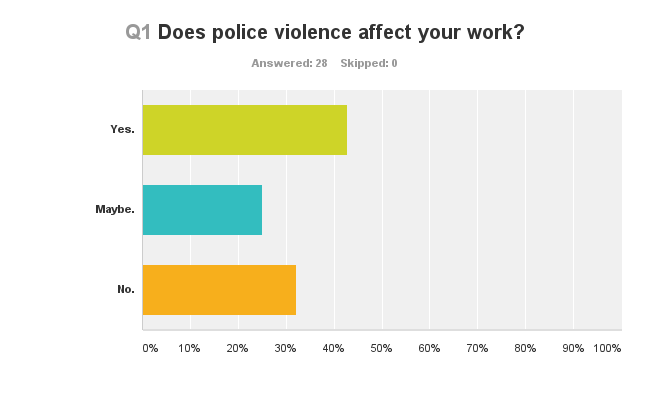 There was a nearly even split among respondents who said that police violence affected their work (46 percent said it did; 34 percent said it did not). The feelings of conflict, however, have not stopped people from speaking out and taking action. A few respondents said their organizations had taken steps to educate local law enforcement about the community through cultural sensitivity training and crisis intervention training, while others had formed neighborhood watch groups and other programs that encourage and involve increased police presence. And then there were respondents whose groups engaged in both demonstrations against police violence and proactive interaction with their community’s law enforcement. “We work with local police and sheriff’s offices in all of our communities to set up crime watch programs.” –Rod S.